Running a program every minutes in the task scheduler will mimic a service at low cost. I have always been interested by exotic hardware ! 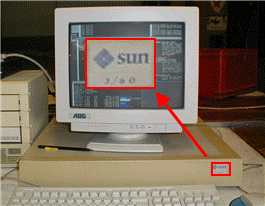 When I started working for Catholic University of Louvain-la-Neuve, I saw a lot of Sun, Digital, SGI stations. Each of them where the Star for one month, in magazines like Byte or PC Magazine. At end of 1995, I wrote a Windows 95 application handling data from a data acquisition card ACL-8111! I had fun playing with the card and I bough the same for myself. I started writing a Linux driver and was very quickly able to handle direct IO access but also IRQ driven access. At end of 1995 I bought a new computer, a Pentium with a PCI BUS and wanted a PCI ethernet card. I choose a NE2000 but unfortunately the one I got was not recognized by linux and I had to hack the ne2000 driver. I started to add some printk instructions to understand what was going wrong, and some reboot later, I got it ! An id ( probably the PCI id ) returned by the card was unknown by the driver ! I had to bypass the test and the card was recognized, and worked fine ! I got it. I had the use of Un*x system when studying at Catholic University of Louvain-la-Neuve and wanted one on my PC too. I got a SCO Unix for i386 and used it to improve my knowledge of C language and C-Shell scripting. SCO was heavy, a little slow, austere and sad, of course I had no mail or talk to disturb friends. When I heard about a new Free Un*x distribution including the kernel sources, I wanted to try it ! It was released on about 20 floppy disks. A that time you had no choices, everything was requiring a kernel compilation ! Even to set the right keyboard mapping you had to rebuild the kernel. Hopefully their was some FAQ and other HOWTO to guide us. This compiles all crazy things I did with Linux. Some of these were crazy at the time I did them, or crazy because of the way I did them. Some are still crazy now, other are just common. I'm trying to add an new story from time to time. Here are some softwares I made for the public domain. MKSBackup is a free front-end for common backup tools like MS Windows ntbackup, and it successor wbadmin, Un*x tools like tar, but also popular ghettoVCB to backup Virtual Machine on VMware ESX(i) host.